The top House, Senate and gubernatorial races that still haven’t been called. In Georgia, Republican Brian Kemp has 50.3 percent of the vote to 48.7 percent for Stacey Abrams with 100 percent of precincts reporting. But Abrams’ campaign is waiting for more absentee and provisional votes to be counted to see if Kemp drops below a majority of the vote, which would trigger a runoff between Kemp and Abrams in December. Uncalled Senate races: Arizona, California and Florida. Republicans have secured 51 Senate seats and Democrats 46 heading into the next Congress, but the final margin could depend on just a few thousand votes in two states. Democratic Rep. Kyrsten Sinema took a lead of less than a tenth of a point Thursday night in Arizona’s Senate race, where she and GOP Rep. Martha McSally are awaiting the state’s count of an additional half-million ballots. Meanwhile, Florida Gov. Rick Scott, a Republican, leads Democratic Sen. Bill Nelson by two-tenths of a percentage point as their state heads for a recount. 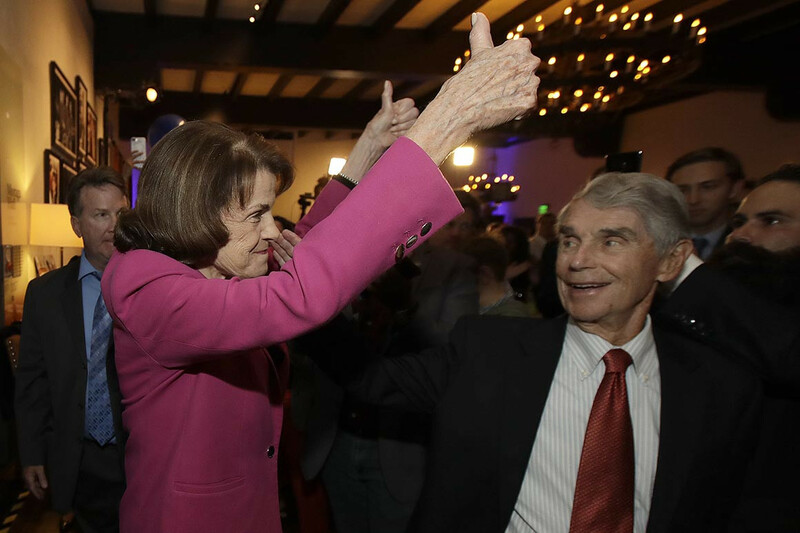 California, meanwhile, is guaranteed to stay in Democratic hands, but the state is still counting ballots in the intra-party race between Democratic Sen. Dianne Feinstein and Democratic challenger Kevin de Leon. Feinstein currently leads by more than 8 percentage points. Mississippi‘s November elections have been called, but the state’s second Senate seat is headed to a runoff between Republican Sen. Cindy Hyde-Smith and Democrat Mike Espy. Uncalled House races: 11 across seven states. Eleven Republican-held House districts remain uncalled, giving Democrats the possibility of expanding their current net gain of 31 seats in the House. The latest calls flipped two seats to Democrats: Washington’s open 8th District and Georgia’s 6th District — the site of the widely watched 2017 special election that became the most expensive House race ever — in the Atlanta suburbs, where Democrat Lucy McBath defeated GOP Rep. Karen Handel by a percentage point. In Georgia’s neighboring 7th District, GOP Rep. Rob Woodall has less than a half-point edge over Democrat Carolyn Bourdeaux. Five of the undecided races are in California, where Democrats are currently ahead in two districts and Republicans lead in the other three. But the final results may not be known for weeks as counties go through the process of counting their late mailed ballots. And in Maine, just a few hundred votes separate GOP Rep. Bruce Poliquin from Democrat Jared Golden. But with both well below 50 percent of the vote, the race could become the first congressional test of Maine’s new ranked-choice voting system. Voters who supported last-placed candidates will have their votes allocated to their second preference, or third, until one candidate reaches a majority. CA-10: GOP Rep. Jeff Denham vs. Democrat Josh Harder. CA-25: GOP Rep. Steve Knight vs. Democrat Katie Hill. CA-39: Republican Young Kim vs. Democrat Gil Cisneros. CA-45: GOP Rep. Mimi Walters vs. Democrat Katie Porter. CA-48: GOP Rep. Dana Rohrabacher vs. Democrat Harley Rouda. GA-07: GOP Rep. Rob Woodall vs. Democrat Carolyn Bourdeaux. ME-02: GOP Rep. Bruce Poliquin vs. Democrat Jared Golden. NJ-03: GOP Rep. Tom MacArthur vs. Democrat Andy Kim. NC-09: Republican Mark Harris vs. Democrat Dan McCready. TX-23: GOP Rep. Will Hurd vs. Democrat Gina Ortiz Jones. UT-04: GOP Rep. Mia Love vs. Democrat Ben McAdams.